Democrats are planning a meeting hours before the Senate plans to vote on a short-term spending bill that would keep the federal government open for another four weeks. Three Democrats said they will back the bill. With less than 2-and-a-half hours of government funding left, President Donald Trump tweeted Friday night that the Democrats want the government to shut down. He claimed they have calculated it as a political win to “help diminish the great success” of recently passed tax cuts. 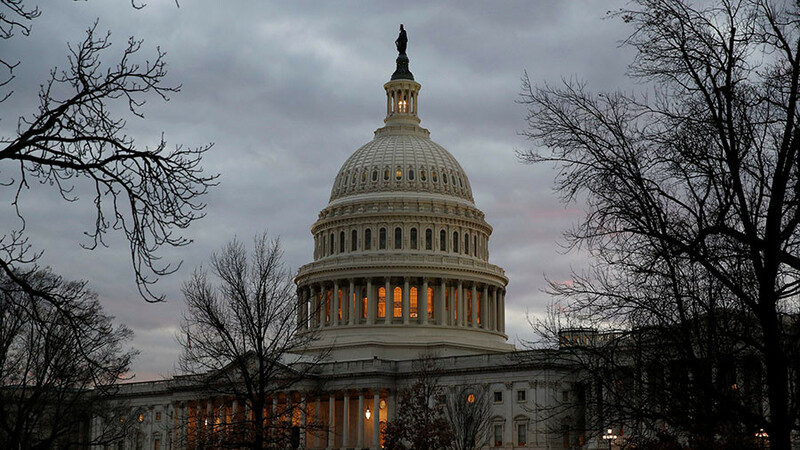 The US Senate has until midnight to pass a spending bill that would avert the first shutdown of the federal government in four years. Hours before the deadline, Senate Democrats scheduled a closed-door caucus meeting at House Minority Leader Nancy Pelosi’s (D-California) office, according to multiple reports. LOCKED IN: Senate to hold key procedural vote on the House-passed CR at 10pm. Needs 60 votes to advance. Senate Majority Leader Mitch McConnell (R-Kentucky) set the cloture vote on the continuing resolution for 10:00pm EST. Here’s the shutdown state-of-play right now: House Dem leadership currently meeting in Pelosi’s office, Senate Dems meeting at 830pm, and Senate vote on the 4-week CR at 10pm. On Friday, Senator Joe Donnelly (D-Indiana) said he would vote in favor of the bill to protect his constituents’ pensions. Today, I will vote to keep the government open for a fourth time for FY2018 through a continuing resolution. Just because I will vote to pass this doesn’t mean I like it. Later, Senator Heidi Heitkamp (D-North Dakota) became the third Democrat to announce that she would vote to keep the government running. I will vote to keep the government open, but that is not an endorsement for a bill that just kicks the can down the road another few weeks. On Thursday, the House voted 230-197 to pass a continuing resolution (CR) that would fund the federal government through to February 16. The 51 Republicans in the Senate need 60 votes to overcome a filibuster, which Democrats have threatened. Senate Republicans expected to break with their party include Rand Paul of Kentucky and Jeff Flake of Arizona. Senator Lindsey Graham of South Carolina has also expressed opposition to the CR passed in the House, but late Friday, Graham proposed a 3-week funding bill to last until February 8, as opposed to the House bill that funds the government through February 16. Earlier Friday afternoon, uncertainty seemed to be all that came out of a meeting between Trump and leaders of both parties in Congress. “We made some progress, but we will have a good number of disagreements,” Senate Minority Leader Chuck Schumer (D-New York) told reporters upon returning to Capitol Hill. Republicans and Democrats traded blame for the possible shutdown before the midnight deadline. “The ball is in Senator Schumer’s court,” Senator John Cornyn (R-Texas) said, encouraging the minority leader to work with top Republican lawmakers Senate Majority Leader Mitch McConnell (Kentucky) and House Speaker Paul Ryan (Wisconsin). Senate Democrats have threatened to filibuster the four-week funding bill that cleared the House Thursday evening. Any short-term measure would be the fourth stopgap spending bill since the current budget year started in October. A shutdown would be the first since 2013, when tea party Republicans, in a strategy not unlike the one Schumer is employing now, tried to use a must-pass funding bill to force then-President Barack Obama into delaying implementation of the Affordable Care Act, better known as Obamacare. At that time, Trump told Fox & Friends that the ultimate blame for a shutdown laid at the president’s feet. “I really think the pressure is on the president,” Trump said in 2013. With a shutdown, food inspections, federal enforcement, airport security checks, and other vital services would continued, as would Social Security, other federal benefit programs and military operations. Most federal workers and armed service members, however, would not be paid.